These are pin-bushing type couplings whose body is made of aluminum alloy. Backlash is kept extremely low by combining high-precision pins with dry metal. The compact design limits total length and the angle of deflection allowed is 1°. A universal system is used for hub coupling, which makes shaft reaction force due to mounting misalignment extremely small. There is also a damping effect from sliding at the friction surface between the pin and dry metal. 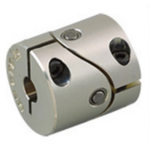 A clamp system employing friction is used to mount the coupling on the shaft, making mounting easy.